The Mayo Group and owner John McGrail came under public scrutiny again in downtown Worcester when a group of nonunion carpenters set up a strike line outside the Bancroft Commons property at the end of last week and continued it earlier this week. Today, the carpenters demonstrated in front of Mayo's corporate headquarters in Dorchester. The carpenters are owed $55,000 for work they did on the project for Ramirez Drywall. The subcontractor has not been paid for the work and so he has been unable to pay the workers. 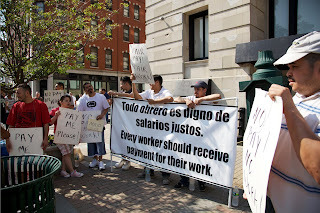 Ramirez and the carpenters contacted NERCC Organizer Manny Gines for assistance, after seeing that the union had helped other workers receive owed wages recently. Bancroft Commons is a major residential renovation project covering several blocks downtown, bordering Worcester Common and the Worcester Telegram and Gazette. The project has been the site of consistent problems. Late in 2007, NERCC Organizers talked to nonunion carpenters on the site who were having issues with the way they were being paid. One carpenter told a reporter from the Worcester Telegram that "sometimes" taxes were taken out of his check. The story was given prominent coverage in the paper and Mayo began its strategy of portraying the union as the boogeyman to explain away issues on the job. Several months later Clive McFarlane, a columnist for the Worcester Telegram, wrote a second piece in the paper, detailing allegations by more nonunion immigrant carpenters employed on the Bancroft Commons project. This time the story got worse. Three of them told McFarlane that they had not been paid wages owed for work they did for Mayo. They were each owed more than $1,700 and had filed complaints with the Attorney General's Office. --did not notify state authorities, as required by law, of asbestos demolition. --ignored a stop work order from the state and continued to remove asbestos from areas of the building where residents were living. McGrail and one of the Mayo Group Companies, JMRealty eventually pleaded guilty to several of the counts related to improper handling of asbestos, evasion of unemployment insurance, failure to provide pay records, and failure to withhold income tax. McGrail narrowly escaped jail time. He and JMRealty were fined $100,000 each and sentenced to three years of probation. 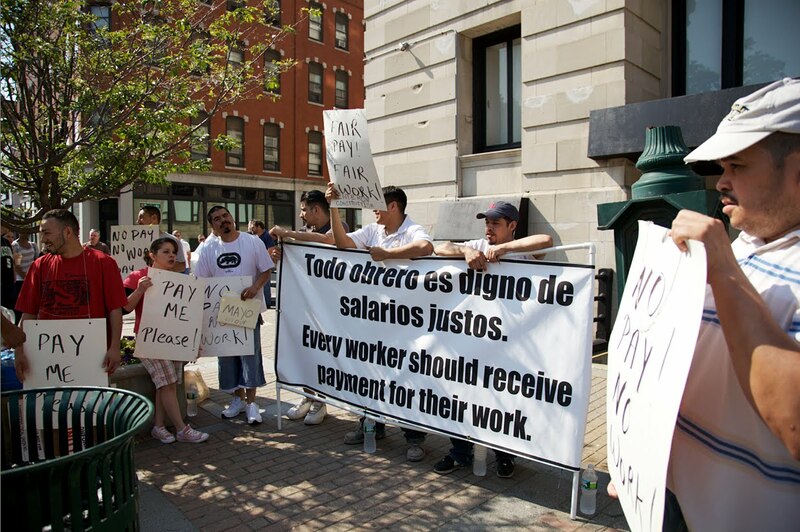 After the strike line was established last week in Worcester, representatives of the Mayo Group spoke to Ramirez and the carpenters, but did not pay them. When contacted by the Telegram and Worcester Magazine, Mayo suddenly claimed there were quality issues with the work produced and the issue was the result of the Carpenters union trying to exploit the situation.